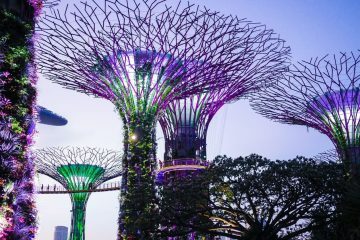 Singapore travel guides to inspire your next trip. Singapore doesn’t have a reputation as one of Asia’s most exciting destinations. Don’t skip it though – scratch the surface and Singapore has so much to offer. Start your adventure hunting out the coolest places in Singapore – Instagrammable locations guaranteed. Feeling adventurous? Try some of Singapore’s weirder food – you could be in for a pleasant surprise. The Colonial District combines past and present: where the state’s colonial past meets contemporary chic. Brush up on history and see some of Singapore’s biggest sights – Old Parliament House, Old Supreme Court and Victoria Theatre and Concert Hall are good places to start. While you are in the area, be sure to visit the Singapore Art Museum and the National Museum of Singapore. Once you’ve finished indulging in some culture, indulge in one of the many restaurants and bars on offer. If you’re looking for vibrance and colour, head to Chinatown. The streets are perfumed with the aromatic smells of traditional food and the colours of reds and golds bring the town to life. Chinatown is a great place to submerge yourself in an area that truly represents Singapore’s heritage. One of the area’s biggest sights, the Sri Mariamman Temple is an elaborate construction that is not only Singapore’s oldest temple but is also a national monument. Pay a visit to the Buddha Tooth Relic Temple Museum, which explains the span of Singapore’s religious heritage. If shopping is more your thing, Chinatown Street Market is one of the best places in Singapore to pick up a few souvenirs to bring home. Competing with Chinatown’s vibrancy, Little India is packed with excitement and colour. There’s plenty to see, do and taste in this buzzing district. Follow your nose and taste the sumptuous flavours of South India such as roti and Teh Tarik: more curiously known as pulled tea. Sentosa Island is the place where locals go for a slice of beach life. Packed with beaches and theme parks, it’s a stark contrast to the city. Let your hair down at Universal Studios or Adventure Cove Waterpark, the Butterfly and Insect Kingdom – all are fun – if very commercial days out. It’s all about views and thrills at the Skyline Luge – luge down the slopes in a zippy number and follow it up with a (much more sedate) ride in the aerial skylift – panoramic views guaranteed. Probably not one for those of you that are scared of heights! Kusu Island is steeped in myth. Legend has it that the island was formed from a giant tortoise, transforming itself into an island in order to save the men who were shipwrecked there. Myth or no, it’s one of the quieter parts of Singapore and a great way to escape the hustle and bustle of the city. Explore its temples, take a dip in the lagoon or just chill at the beach.